9/11 marks an important date in World history. It is a day when history was witness to two world views in action in one country, albeit over a difference of one century. 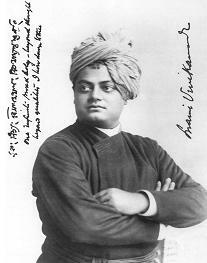 Swami Vivekananda made his historic speech at Chicago on this day, 1893 in the World Parliament of Religions. He won over the audience as well as the Americans as he presented the Hindu philosophy and spoke about how the Hindu nation gave refuge to the persecuted Jews and Parsis. He also warned about the dangers of fanaticism and bigotry. A century later, On 9/11, 2001, on the same day, a sample of religious fanaticism was demonstrated to the world – “the destruction of the World Trade Centre in America”. For the sake of world peace, the philosophy of “Sarve Bhavantu Sukhinah ” and “Ekam Sat” viz, the the Hindu view of life should gain currency and it can happen only by a strong, resurgent Bharat . “Sisters and Brothers of America, It fills my heart with joy unspeakable to rise in response to the warm and cordial welcome which you have given us. I thank you in the name of the most ancient order of monks in the world; I thank you in the name of the mother of religions; and I thank you in the name of the millions and millions of Hindu people of all classes and sects. My thanks, also, to some of the speakers on this platform who, referring to the delegates from the Orient, have told you that these men from far-off nations may well claim the honor of bearing to different lands the idea of toleration. I am proud to belong to a religion which has taught the world both tolerance and universal acceptance. We believe not only in universal toleration, but we accept all religions as true. I am proud to belong to a nation which has sheltered the persecuted and the refugees of all religions and all nations of the earth. I am proud to tell you that we have gathered in our bosom the purest remnant of the Israelites, who came to the southern India and took refuge with us in the very year in which their holy temple was shattered to pieces by Roman tyranny. I am proud to belong to the religion which has sheltered and is still fostering the remnant of the grand Zoroastrian nation. Sectarianism, bigotry, and its horrible descendant, fanaticism, have long possessed this beautiful earth. They have filled the earth with violence, drenched it often and often with human blood, destroyed civilization, and sent whole nations to despair. Had it not been for these horrible demons, human society would be far more advanced than it is now. But their time has come; and I fervently hope that the bell that tolled this morning in honor of this convention may be the death-knell of all fanaticism, of all persecutions with the sword or with the pen, and of all uncharitable feelings between persons wending their way to the same goal. This entry was posted in Hindutva, History and tagged 9/11, Hindutva, Indias Message to world, Islamic Terrorism, Jihad, September 11, Vivekananda, World trade centre, WTC, WTC Attack on September 11, 2009 by arisebharat. Dhynavaad . Informative and understanding of Swami Vivekananda’s message.